MONTREAL – November 24, 2015 – TickSmith’s TickVault Platform has earned the fast-growing firm the inaugural Innovators Award from FIA. 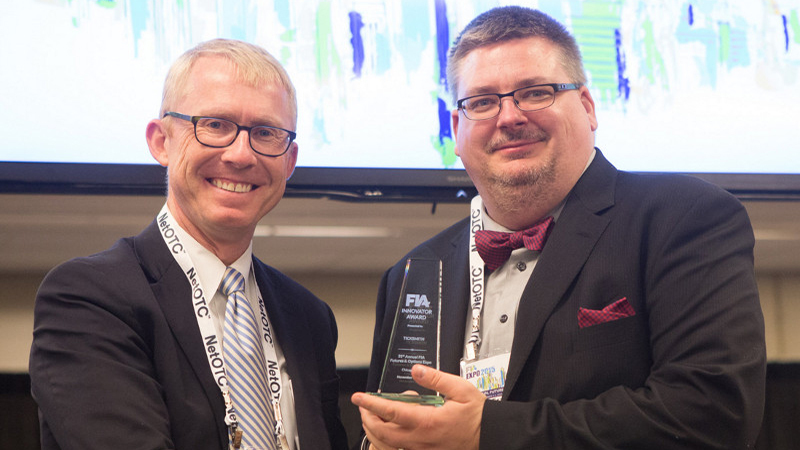 Walt Lukken, CEO of FIA, the world’s leading trade organization for the futures, options, and cleared swaps markets, presented the award to TickSmith CEO Francis Wenzel at the recent FIA Expo in Chicago. Based on Hadoop technology, the TickVault platform comes as a complete solution. It can be added easily to existing Hadoop clusters. TickVault is also available as a service and delivered as an appliance that includes all hardware. Its powerful processing, analytic, normalization and transformation capabilities are ideal for financial firms that must accumulate, aggregate, analyze and disseminate large amounts of data from disparate sources. “Financial institutions are looking at the exponential gains and competitive advantages that Hadoop and big-data technologies provide,” said Wenzel. “That’s especially true for firms that deal in financial derivatives, with their complex and fast-moving data flows. FIA is the leading trade organization for the futures, options and cleared swaps markets worldwide. FIA’s membership includes clearing firms, exchanges, clearinghouses and trading firms from more than 25 countries as well as technology vendors, lawyers and other professionals serving the industry. FIA’s mission is to support open, transparent and competitive markets, protect and enhance the integrity of the financial system, and promote high standards of professional conduct. As the principal members of derivatives clearinghouses worldwide, FIA’s member firms play a critical role in the reduction of systemic risk in the global financial markets. FIA and its affiliates FIA Europe and FIA Asia make up the global alliance FIA Global, which seeks to address the common issues facing their collective memberships. For more information, contact Heather Vaughan at 202-466-5460. TickSmith is a leader in Big Data applications for the brokerage ecosystem. Its TickVault platform is used for data centralization, distribution, market surveillance, strategy discovery and analytics. It was designed for trading and risk groups, regulators, exchanges and vendors who must accumulate, transform, analyze and disseminate scales of data from multiple sources. TickVault manages structured and unstructured data, exchange & tick data, reference data, FIX, back-office, media content, time-series, statements and more. Delivered as a complete solution, TickVault can be added to existing Hadoop clusters, is available SAAS and as an appliance with hardware. For more information, please visit www.ticksmith.com.